Artist's concept of NASA's Curiosity rover approaching Mars. Curiosity is slated to land on the Red Planet in August 2012. As NASA prepares to launch its huge new Curiosity rover toward Mars on Saturday (Nov. 26), the current travails of a robotic Russian probe stranded around Earth offer an uncomfortable truth: Getting to the Red Planet is tough. Russia's Phobos-Grunt probe, which launched Nov. 8 on a mission aimed at the Martian moon Phobos, remains stuck in low-Earth orbit, and the chances of salvaging the craft appear slim. If Phobos-Grunt can't be saved, it will be the 19th straight Russian Mars mission that failed to achieve its mission goals in full. 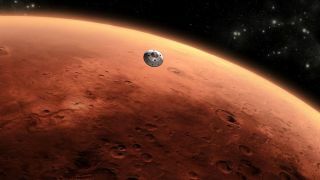 But Russia isn't alone in its Red Planet difficulties; other space agencies, including those of Japan, the United States and Europe, have felt the sting of Mars failure in the last dozen years or so. Scientists and engineers working on Curiosity's $2.5 billion mission, which is officially known as the Mars Science Laboratory (MSL), acknowledge that success is not guaranteed. But they say they've prepared as well as they can, and they're confident things will go well. "We're expecting tremendous results," MSL manager Pete Theisinger, of NASA's Jet Propulsion Laboratory (JPL) in Pasadena, Calif., told reporters in a Nov. 10 launch briefing. MSL, which aims to investigate whether Mars was ever capable of supporting life, will be the 40th spacecraft to blast off toward the Red Planet. About 60 percent of MSL's predecessors failed to achieve their main mission goals. The United States finally broke through with Mariner 4, which made the first successful Mars flyby in 1965 and sent 21 photos home to Earth. Over the years, NASA racked up more and more Red Planet successes, including a recent run headlined by rovers such as Spirit and Opportunity, landers like Phoenix and orbiters such as Mars Odyssey and the Mars Reconnaissance Orbiter. But the agency also lost two separate Mars orbiters and a lander in the 1990s. Russia and Japan suffered Mars failures around the same time, as did the European Space Agency, which lost its Beagle lander in 2003 (though ESA's Mars Express spacecraft successfully entered Mars orbit during that mission). In short, getting to Mars remains tough. This fact may just reflect the difficulty of spaceflight in general, rather than suggesting the existence of some sort of Mars curse, experts say. "I'm not sure Mars is harder on average than other places," said JPL's Richard Cook, MSL deputy project manager and a veteran of several previous NASA Mars campaigns. "We've been there a lot, or relatively a lot, so we have maybe enough statistics to talk about it." To get a spacecraft to the surface of another planet, literally thousands of separate parts have to work perfectly, and perfectly in sequence. A single screw-up could doom the mission — especially if that screw-up comes during a crucial mission phase like entry, descent and landing. "With EDL, you get that one shot, and by the time it's there, it's all on its own," Cook told SPACE.com. "It's got to work the first time." MSL's landing will probably inspire more nervous hand-wringing than usual among the mission team. The Curiosity rover is the size of a Mini Cooper and weighs a ton, too big to land cushioned inside airbags like Spirit and Opportunity did. But the sky crane performed well in full-up computer simulations, officials said, and the MSL team thinks it will do its job just fine. "We've done a tremendous amount of entry, descent and landing reviews and tests," Theisinger said. "We're confident that we've done our due diligence." While due diligence is required, it doesn't necessarily guarantee success. It's impossible to anticipate or plan for every possible problem that could crop up during Curiosity's mission, and that's what makes Theisinger most nervous. "I think the thing at the top of my concern list is what I don't know," he said. "These things are very complicated beasts, and you test the heck out of them. But you can't test all their interactions, you can't test them for the length of time of the mission." So some surprises are bound to emerge, Theisinger added. For example, scientists and engineers had to fix three unanticipated problems while Spirit and Opportunity were cruising toward Mars in 2003, Theisinger told SPACE.com earlier this year. Such success stories could buoy the MSL team if anything goes wrong after the mission blasts off on Saturday. And it may give some measure of hope to Russian engineers still fighting to send poor Phobos-Grunt on its way.